I am sorry to hear you are having these problems with your Evinrdue 25. I know that can be frustrating. Hopefully, we can get you back on the water quickly. Your question was - Why are my battery cables getting really hot? I would be happy to help you with that. Battery cables get hot when they are rotted internally. By rule, no cable can any corrosion at all inside of it. 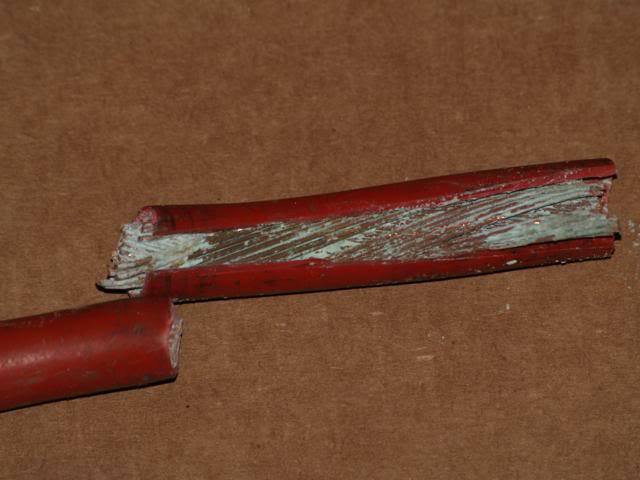 If a battery cable has corrosion inside of it, what happens is that corrosion takes voltage and it turns it into heat, and in that same process, it also causes an overall drop in available voltage to the starter at the same time. The more corrosion there is inside of the cable, the hotter it gets, and the hotter it gets, the amount of voltage lost through the cable is also higher. For example, if you just had a little corrosion inside of the cable, with a volt meter, you might measure 11V at one end of the cable and 10.5V volts at the other end of the cable, which isn't to bad. But if there is a lot of corrosion inside of that cable, and the cable is getting really hot, you might measure 11V at one side of the cable, and only 6V on the other side of it. So where you will need to start is by getting a new set of cables, and if there is nothing else wrong here, that will solve the problem. I'm also attaching a picture for you. In the picture you will see all sorts of green corrosion. The cable in this picture was also getting very hot, and that corrosion is the reason why. Thank you but the battery cables getting hot is not the main question. I figured that much out from googling it. My main concern is that when I removed my starter and solenoid I may have miswired them. The starter is no problem..two cables..one short red cable from bottom of starter to the closest large post of solenoid.Likewise, my main cable coming large plug is easy mostly. One large red and two smaller red cables (one small red cable is fused) to other large post of solenoid, one small yellow and black wire to top small post of solenoid, one small black wire to other post of solenoid. My problem is I have a second small black wire coming from large plug which I thought was to ground, but now the starter does not turn. It worked two days ago but the engine would not run properly so I removed carburetor to rebuild it and had to remove the starter to access the carburetor nuts.Thank you but the battery cables getting hot is not the main question. I figured that much out from googling it. My main concern is that when I removed my starter and solenoid I may have miswired them. The starter is no problem..two cables..one short red cable from bottom of starter to the closest large post of solenoid.Likewise, my main cable coming from the large plug is easy mostly. One large red and two smaller red cables (one small red cable is fused) to other large post of solenoid, one small yellow and black wire to top small post of solenoid, one small black wire to other post of solenoid. My problem is I have a second small black wire coming from large plug which I thought was to ground, but now the starter does not turn. It worked two days ago but the engine would not run properly so I removed carburetor to rebuild it and had to remove the starter to access the carburetor nuts. On your starter solenoid you should have 2 small wires. Yellow with a red stripe, which is your start wire. And black which is a ground wire. Black needs to be grounded at all times, so you will need to verify that the black wires in fact grounded. Then you would need to check with a volt meter that yellow/red show 12V each time you turn the key to start. If yellow/red is showing 12V each time you turn the key to start, and if the solenoid is not clicking, then your solenoid is bad. If you are not getting 12V on that yellow/red wire each time you turn the key to start, then you would need to check for power on that very same wire at both the key switch as well as the neutral switch inside of the shifter. Does that all make sense to you. You are very welcome, it was my pleasure. Good morning. I do not understand your reply. I am good. No more questions for now. I did rate you. 👍 i did not download app. Trim switch just clicks in solenoid, no other response. Ok, I have a 1989 Olympic 2100 with an OMC outboard V-4 120.